The constant stream of podcasts continues! The Space Brothers Podcast dropped their latest episode where they sit down with Brian Fox to talk about everything from how he got into BMX, his days racing, what made him want to switch over to freestyle, riding big contests like the X Games and more. Brian has been blowing up on the contest scene the past few years doing a ton of wild tricks on his bike. If you want to get to know him a little better, here’s the podcast for you! “From a competition standpoint It seems like each year we hear about another amazing rider who comes out of seemingly nowhere to become one of the biggest names in the sport. There’s so many incredible riders bursting onto the scene these days. It’s hard to keep track of them all. One of those riders is Brian Fox. After qualifying in 1st place at last years X Games dirt competition Brian was able to put together a perfect run and ended up with a bronze medal in the finals. Kind of crazy considering he’s spent the majority of his life in Florida where there’s mostly sand. 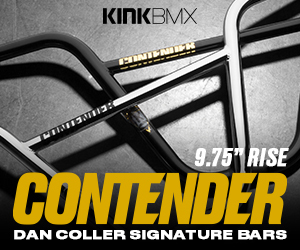 Brian’s not just a dirt jumper, he also competes in BMX park, and rides a lot of concrete bowls and skateparks. It’s safe to say he’s a threat to win any contest he enters! Even though you might not recognize Brian’s name as well as some of the other competitors, he didn’t come out of nowhere. He’s been around for a little while. I first met Brian while doing a BMX show with Rob Nolli 5 years ago. It was obvious right away Brian had serious skills and pulled off everything he tried. He had an explosive style yet made everything look easy. Since it was a show I only got to see a small sample of what Brian could really do. A few months later I saw a video of him riding and I was blown away! Brian has that rare combination of skill and power added to today’s most popular video game level tricks and he’s always working on something new! We sat down with Brian at the Master Blaster Planet Studios and asked him about riding dirt in Florida, his early racing career, the first time he saw freestyle, his secrets to putting together a high scoring run at a major contest, landing his first 1080, riding in Mike Spinner’s backyard, learning from his dad who rode bmx in the 80s, riding for his new sponsor Radio Bikes including his new signature frame, and finding out what his dream contest run would be. Brandon Loupos is heading back home with a gold medal after winning X Games 2018 BMX Dirt Finals! Last night was the BMX Dirt Finals at X Games 2018 in Minneapolis! With 10 amazing riders that were ready to drop in on the roll-in, things heated up quick with a ton of wild riding going down and some really great runs being put together. In the end, Brandon Loupos ended up on top with Logan Martin and Brian Fox coming in behind him. Check out the full replay above, or you can check out the best runs below from the top 3! Watch Brian Fox put his signature Fox Frame from Radio Bikes to work… Plus, some guns. Here’s a fresh video featuring Brian Fox going to work on skateparks, trails and Florida swamps with his signature Fox frame from Radio Bikes! Brian is a machine with a deep bag of tricks that he can throw down on anything you throw in front of him, and he does just that in this video! “MADNESS in The Sunshine State courtesy of Florida’s favorite son – Brian Fox – to celebrate his new signature Fox Frame from Radio. Watch this, hear what Brian has to say, and learn all about the frame that will probably make you do perfect double flips! Check out this new Fuse Protection video featuring Brian Fox! You know you’re in for a treat when Brian Fox has a new BMX video to check out! Here’s a look at his latest for Fuse Protection filled with trails goodness. Plenty of great riding and some clean film work. You can’t go wrong with hitting play on this one. “USA team rider Brian Fox laced up a fresh pair of our new Super Light OMEGA Pads for a session down the trails. You know whenever Brian Fox drops in, you’re going to see some dialed riding go down. Here’s a new video Monster Army just uploaded featuring Brian, and a few guest clips from Mike Varga and Justin Dowell, throwing down at the DDASC park. Plenty of flips, whips, stretched no handers and more to take in. Get on that play button! You already know when you drop a few riders like Brian Fox and Justin Dowell on a ramp setup like Mike Varga’s backyard ramp, you are going to see some amazing riding go down. Brian and Justin recently spent some time up in Canada riding the ramp and stacking clips for this video and there’s pletny of wild ones like the 180 tailwhip barspin and 1080. Check out what went down! That didn’t take too long! Brian Fox joined the Radio Bikes squad the other month and they immediately went to work on his first signature frame, the Fox frame. Today, we get a look at the frame with full details! The Fox frame is made from full 4130 chromoly tubing with a 75.25-degree head tube angle, 71-degree seat tube angle, 11.6″ bottom bracket height, 8.5″ (20.6″) and 9″ (21.1″) standover heights and a 13″ (20.6″) or 13.2″ (21.1″) chainstay length. The frame will come in a 20.6″ top tube length with the shorter standover and chainstay length and 21.1″ with the taller standover and longer chainstay length. You can find gussets on the top and down tubes, a double butted top tube, butted seat tube, integrated seat post clamp, Mid bottom bracket, tapered seat stays with plenty of clearance for 2.40″ tires, chainstay removable brake mounts and 6mm thick, heat-treated dropout! 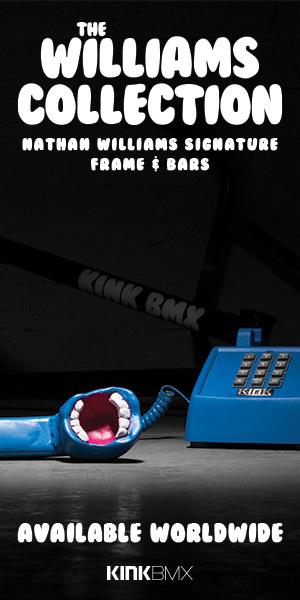 The Fox Frame from Radio Bikes will be hitting BMX shops and mail-orders that carry Radio Bikes later this year. We’ll let you know when it drops! There’s no denying that Brian Fox crushes it on a bike and he’s definitely been on fire with his appearances in a bunch of contests like the Nitro World Games and X Games over the past few weeks. Brian is no stranger to sending some big tricks, which means he’s taken a heavy slam or two in his day. But, things are looking up for Brian because he’s now riding for Fuse Protection, so he’ll be padded up from helmet to ankles with some quality protection to help resist injuries. You can check out a quick Q&A with Brian about joining the team on the FUSE Protection Website!